My Free Style Libre trial ended this week. Was it a good/bad/in different experience? The Free Style Libre is a new way of testing your blood glucose levels. You attach a sensor to your upper arm (right arm if you’re left-handed like me and vice versa), and then you use a reader to scan the sensor and it gives you your results in a second. You can also see what your blood glucose has been doing for the last eight hours, and you can tell if it’s going up or down, quickly or slowly, or staying stable. There’s also a feature for calculating insulin doses, and you can use the reader in the traditional way to test blood glucose through a finger prick if you have the strips suitable for the system. I didn’t use either of these features. It was interesting. As someone who only recently managed to get out of the slightly obsessive compulsive blood testing habit, I scanned a lot. It’ll be hard to go back to limited tests. Seeing what your blood sugar does over eight hours – particularly overnight – is also fascinating. In general, my blood sugar dips first thing, and then rises through the hours of the morning – something I believe is common in most people. I liked it because I could check frequently. Do I think it improved my overall control? Too hard to tell and two weeks doesn’t give you that knowledge. Would I like to keep it? Yes. It’s wonderful being able to check your levels whenever you want. Jokes aside about obsessive compulsive testing – and actually, I didn’t do check half as much as I thought I would – knowing that you can check whenever you want is liberating. I get through five boxes of 50 blood testing strips every two months and sometimes it’s feels as if I’m eking them out, as that works out as less than five strips a day. As I said in my original post, which you can read here, the biggest drawback of the Free Style Libre is that it is not available on the NHS. The sensors need to be replaced every 14 days and they cost £56 (£48 when you apply the VAT exemption you are entitled to as a type 1 diabetic), which works out at £1,248 a year if you use it all the time. Occasional use is an option though. It would be nice to have a few sensors in stock for that possibility. 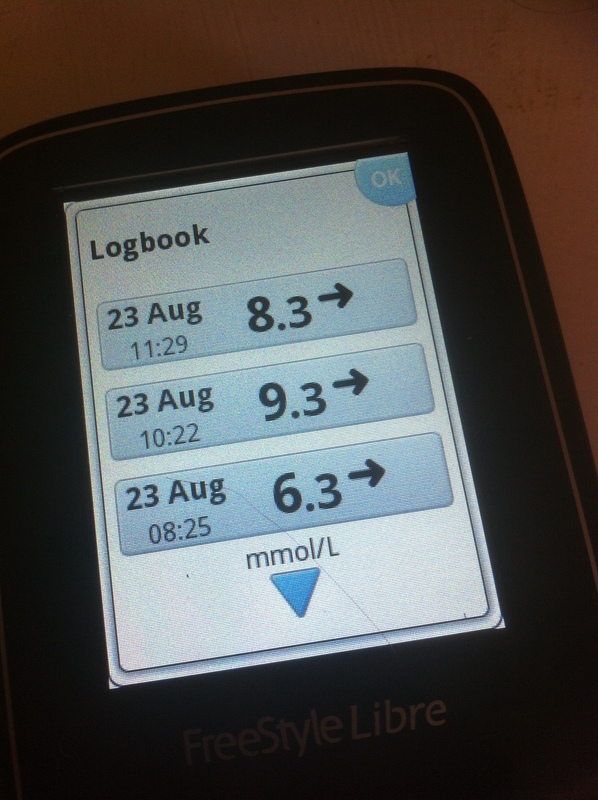 Have you used the Free Style Libre – or is it something that appeals to you? What do you think the benefits to you could be? We’d love to know. Previous Post Can we humanise doctors’ working lives and all be safer? I find that if I don’t feel the need to test, it usually means my blood sugar is okay/stable. I’d love to be able to keep going with the Free Style Libre, but it’s just too expensive at the moment. Hahaha those are good days when they are stable and I’ve barley tested! I agree, I looked into even getting a CGM but they aren’t funded either and I just cannot justify the money. Me too. I’d rather have a CGMS than a pump. Ah well! At least we both know what we’ll be spending that windfall on, if it ever comes. I use about 100 test strips every 10 days and I use a dexcom, Obsessive testing is a matter of degree. We do not yet have this device int he states. I look forward to learning about it. The proof is in the (sugar-free) pudding isn’t it, when it comes to testing? If the number of tests you do keeps you well, then you are doing the right number of tests. Thanks as ever for reading and commenting Rick.